It’s been a busy couple of months leading up to the wedding, so I had to disappear for a few weeks to make sure that everything got done before Ben and I flew over to the US for our big day. 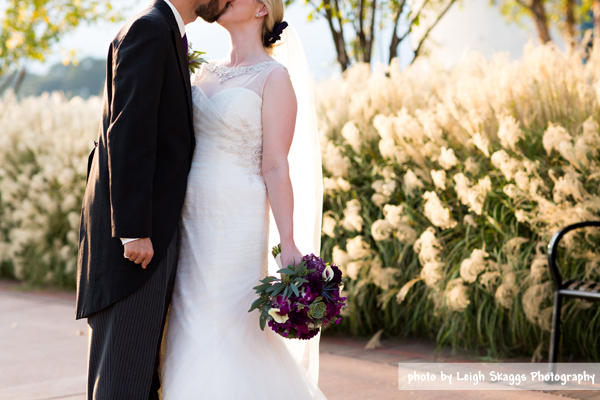 On October 10th, Ben and I had the most fabulous day and we couldn’t be happier with how everything went. I’ll admit, I was a bit nervous about how everything was going to come together and if I would have enough time to get everything done in time, but it all did!! The theme for our wedding reception was what I guess what we could describe as a “London Bakery” – we had a lot of details throughout the day that represented both the US and the UK, but we had to include baking as (let’s face it) there’s a lot of it going on in our house! 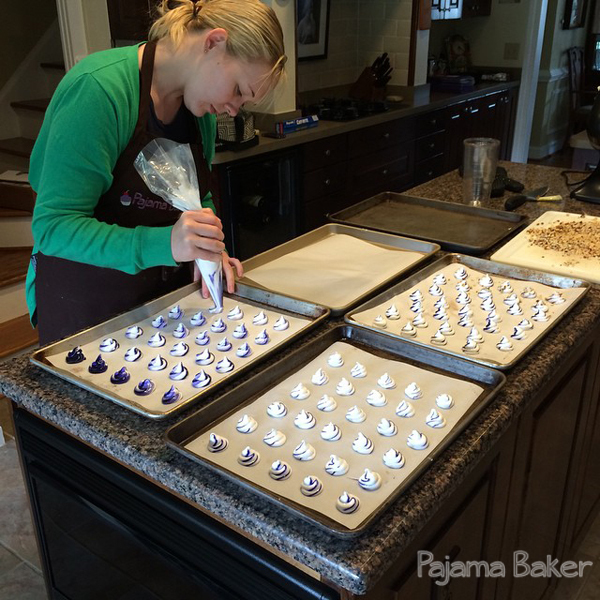 I wanted to share with you all some of the more Pajama Baker details and behind the scenes. I made all of the favors the week before: 600 meringues in 5 different flavours. We had chocolate, hazelnut, peppermint, lemon, and raspberry. 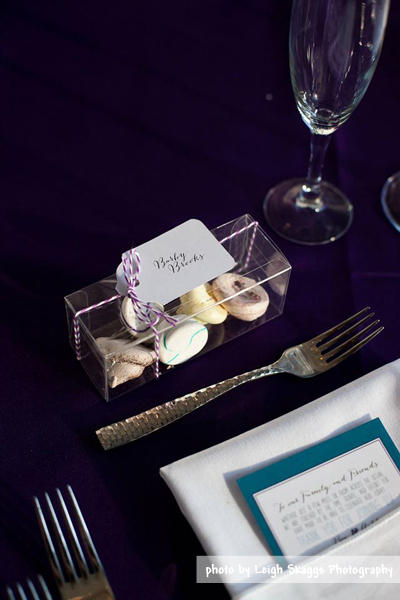 The favors also served as placecards for our guests. 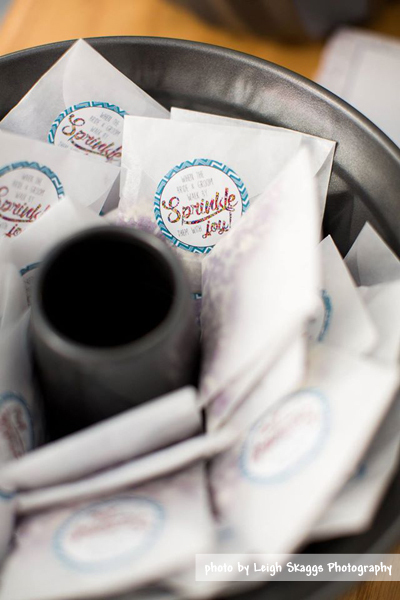 After the ceremony, we had bags of purple and white sprinkles for people to toss instead of confetti or flower petals. 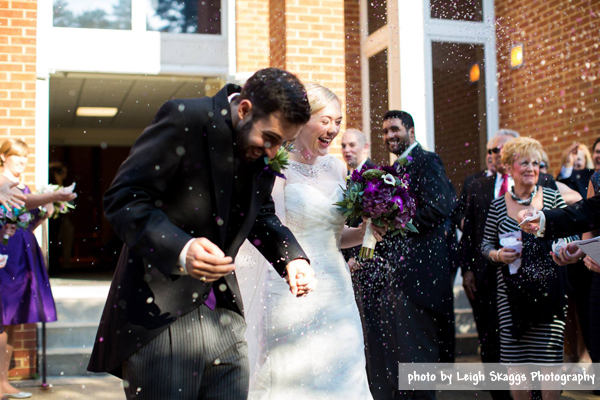 The sprinkles made for some fantastic photos! We had fun and couldn’t stop laughing as people threw them at us. We had some really cool floral arrangements that our florist had a ton of fun with. 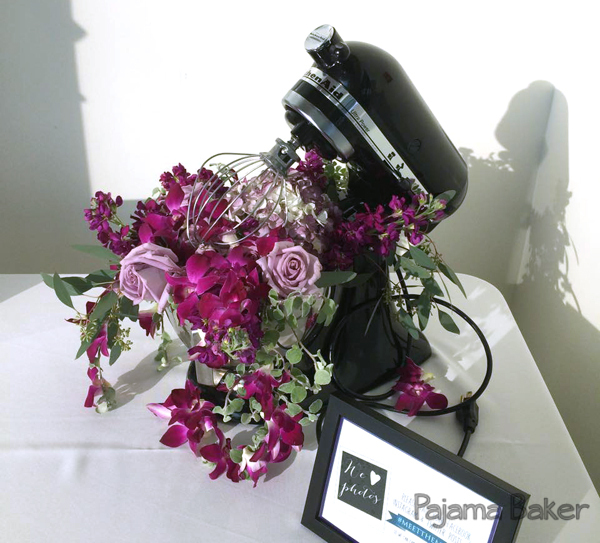 Each table arrangement was in a bundt pan, and we had a big centerpiece as you walked into the reception in a KitchenAid mixer! 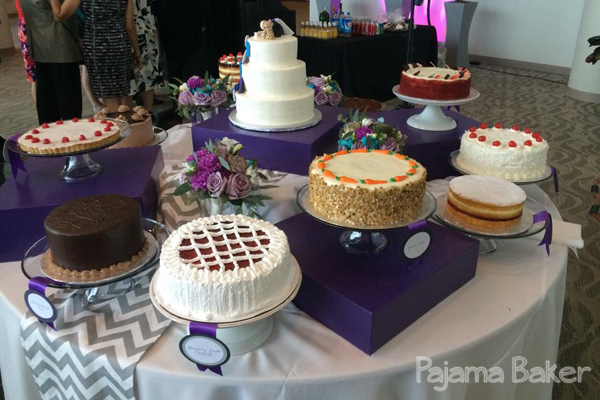 Being a baker, I couldn’t settle on one cake, so we had a buffet of TEN plus our 3-tiered wedding cake, making a total of 13 different types of cake! 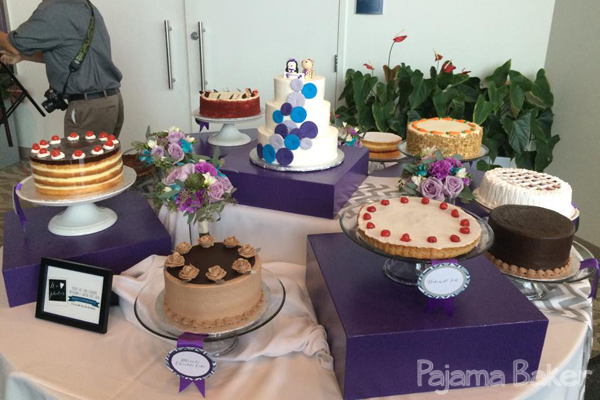 The cakes were a mix of US and UK cakes made by two local bakeries, but two of them were homemade using Pajama Baker recipes. Like I said, Ben and I had the most amazing day and we had a lot of fun planning it, even from across the Atlantic. Now we’re back in the UK and settling back into our normal life. It’s kind of nice not having to spend all our free time designing tableplans or planning timelines. We’re looking forward to this new chapter in our lives together (and a whole new chapter for the Pajama Baker!). Now it’s time to get back to baking, and catching up on some posting from a ton of bakes before the wedding, so keep checking back! I never had a crumpet growing up. You’d always hear the phrase “tea and crumpets” when people would make comments related to England, but before moving to London I couldn’t even tell you what a crumpet was. But then I ate one. And then I ate another. And then I decided that Americans are seriously missing out on crumpets. 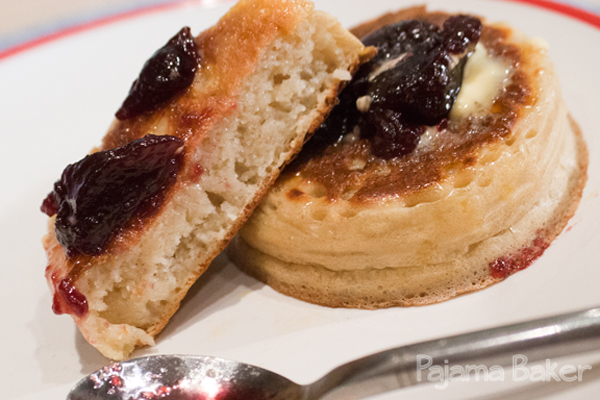 A crumpet is sort of a cross between a pancake and an English muffin. They’re fluffy, flat disks that you cook on the griddle like a pancake, but they’re thick like an English muffin and have a sort of slightly chewy texture to them in the middle due to all of the tubes of air running through them. I love to eat them with a bit of butter and honey, but others like them with jam, or Ben loves his smothered in peanut butter. They’re pretty simple in terms of ingredients, but they definitely take some practice to get them just right. Turn them too soon, and they won’t be tall and fluffy. Turn them too late and they’re burnt on the bottom. So these need to be watched carefully! 1. Mix together the two types of flour and your yeast in a medium-sized bowl. Dissolve the sugar in the warm milk, then pour over the flour and mix with a wooden spoon for 3-4 minutes until you get a smooth batter. 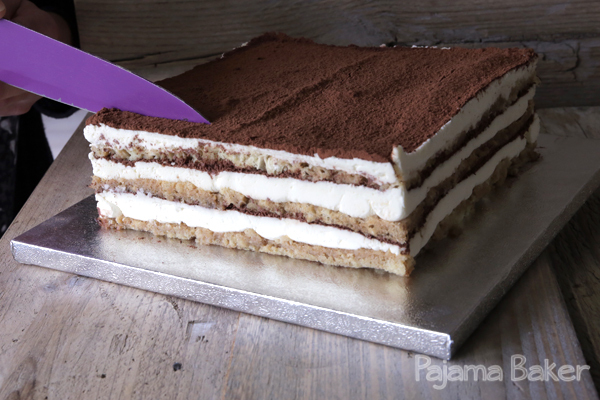 Make sure you mix for the full amount of time to get air bubbles into the mixture. This will produce all of the holes of a quintessential crumpet. 2. Cover your mixture and leave it to rest for 20 minutes to an hour. The batter will rise then fall once it’s ready. 3. Mix your baking soda and salt with the warm water, then beat the mixture into your batter. Add about 3/4 of the water and keep adding it until you get a thick, but still runny consistency. Cover and rest for another 20 minutes. 4. 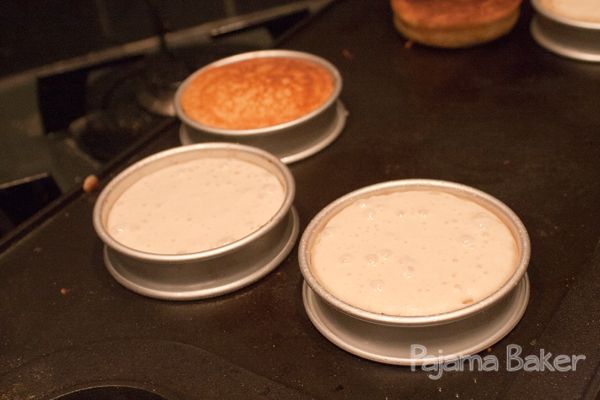 Heat your griddle over a medium heat, then lightly grease the inside of four crumpet rings using the vegetable oil. Also lightly grease your hot griddle with the oil and place the prepped crumpet rings onto the griddle. 5. 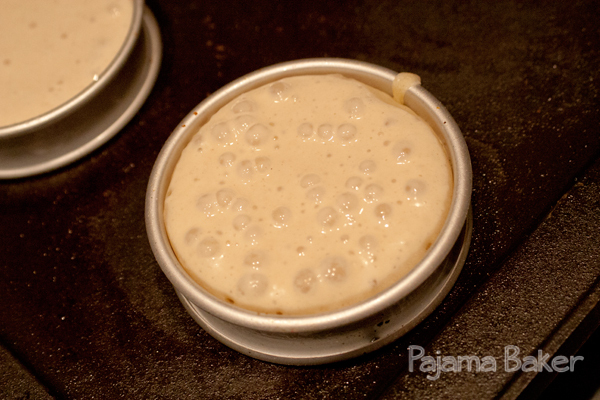 Pour 4 Tablespoons of your batter into each ring. After a couple minutes, bubbles will start to appear on the top (like you see with American pancakes) and the surface will set up. Once this happens, flip your crumpet and the ring over and cook on the other side for another 3 minutes until golden. 6. 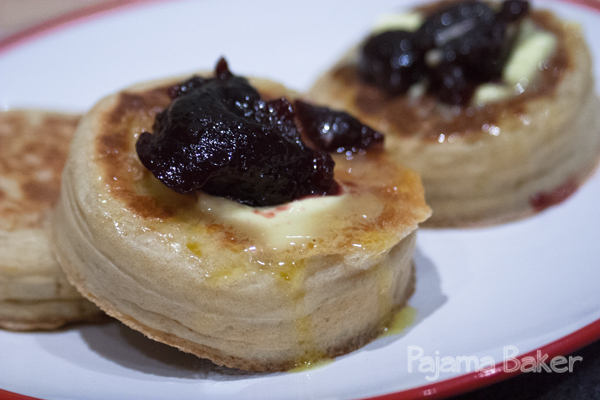 Serve the crumpets while they are still warm, or let them cool and stick them in the toaster before serving. My loaves turned out a little flatter than I would have liked, but that may be due to my handling the dough a little too much, but I was successful in getting the uneven air holes in the final bakes (a characteristic of good ciabatta!). One of my loaves even surprised me with a heart inside! Ben ended up using these to make paninis for lunch this week, so they definitely were put to good use! 1. The night before you want to bake your loaves, make the starter dough. Mix the flour and water in a large bowl, then add the yeast. 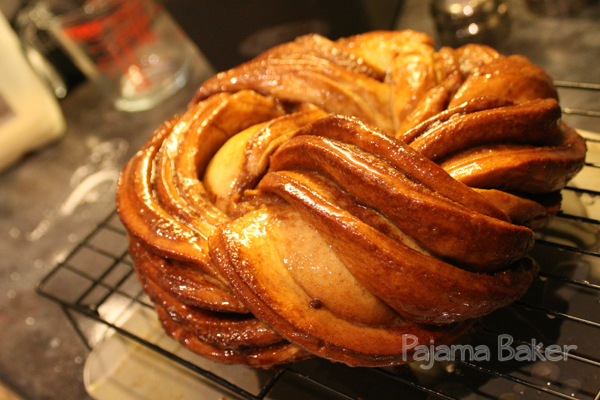 Whisk for three minutes and leave to rise overnight (or at least eight hours). 2. The next day, add the remaining flour and yeast to the bread mixture and mix well. Then add in the water and salt to form, mixing for about five minutes until it forms a wet, sticky dough. 3. 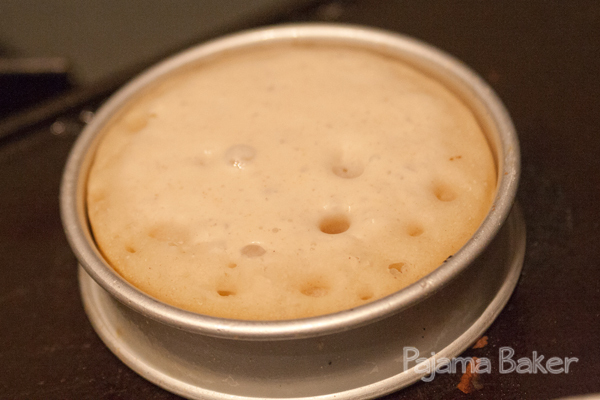 Transfer your dough to a large oiled square container and leave it to rise for at least one hour, or until it doubles in size. 4. 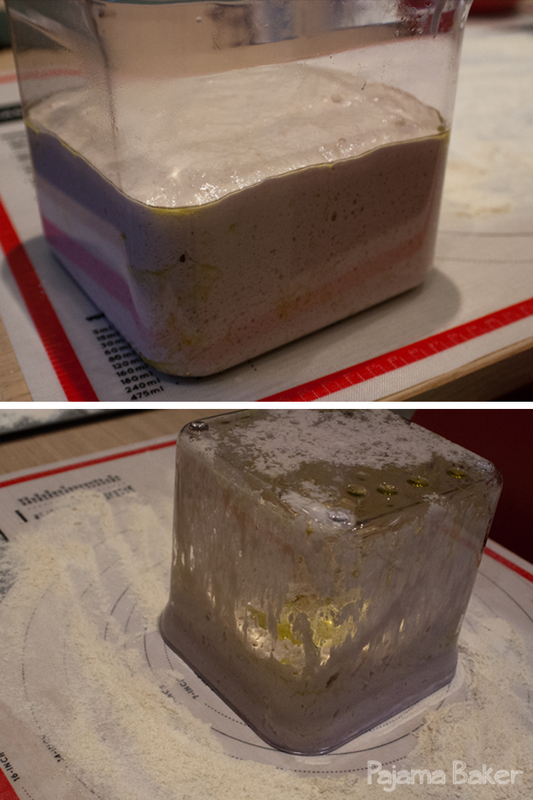 Quickly flip the container upside down onto a heavily floured work surface to turn out your dough. Leave it to rest for another 30 minutes. In the meantime, preheat your oven to 465ºF (240ºC). 5. 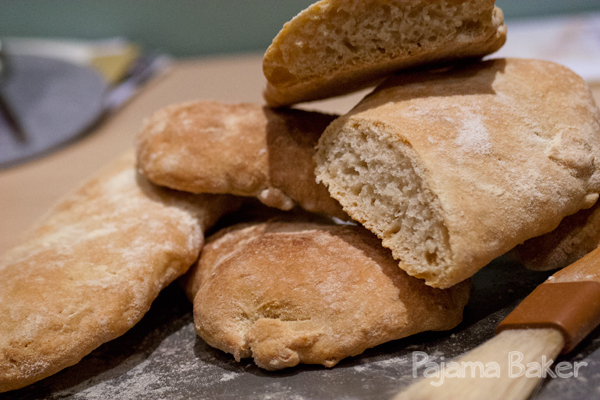 Cut the dough into 3 long strips and gently shape them into ciabatta loaf shapes. 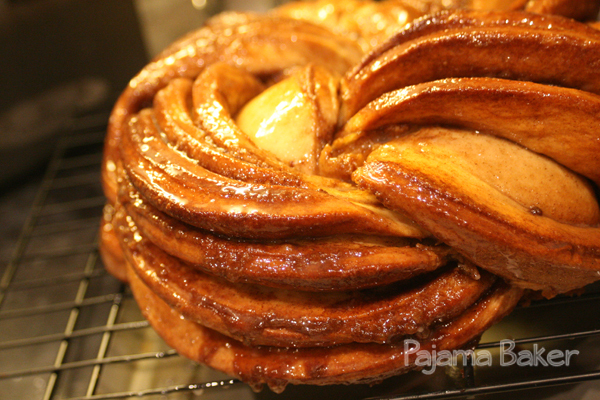 The dough is really sticky and runny, so this can be a bit tricky. Just don’t overwork the dough, or you’ll lose all your lovely air bubbles inside and the loaves will turn out really flat. 6. Place your loaves onto a baking sheet lined with baking paper, then leave them to rest for 10 minutes. This will help the dough to get that last bit of rising in before baking, hopefully helping to make up for any air lost while handling the dough. 7. Bake your loaves for 25 minutes until golden, then immediately transfer them to a wire rack to cool. Ben and I spent the weekend with friends in Edinburgh for the long Bank Holiday weekend. It was a fantastic trip! We saw some wonderful comedy shows as a part of the Fringe festival, and mostly ended up wandering around the city. It was so crowded with several different festivals going on all at once, but the weather was lovely and we were in good company. All in all, a nice mini getaway before the fall kicks off! After last week’s bread episode of GBBO, I found myself really inspired to try my hand at making a filled loaf. 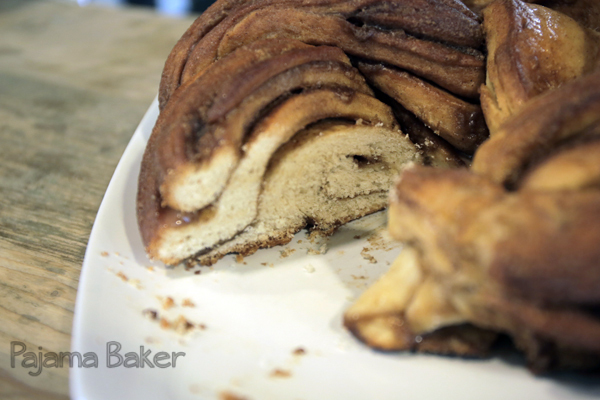 I’d seen a photo on Pinterest for a twisted cinnamon loaf, but most of the recipes used canned cinnamon rolls and just didn’t seem all that appetizing. So about mid-way on hour hour-long flight home, I decided to give it a go. Yes it is more effort than buying a can of cinnamon rolls. But it is all so simple, and you just feel better knowing that you made it yourself – that there are no preservatives or weird stuff mixed in. Plus, it was a nice way to keep the relaxing vibe from the weekend away. I just eyeballed mine, so all of these are approximate! 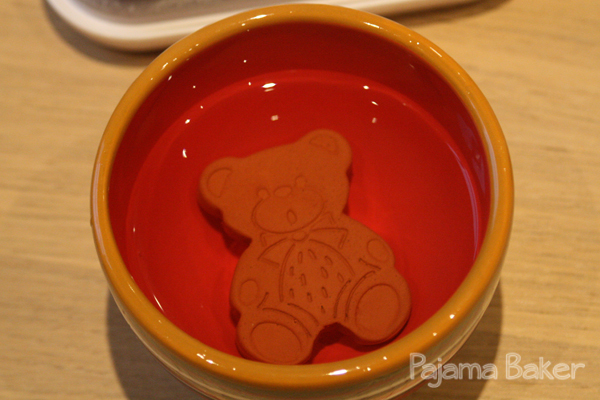 This little guy is my brown sugar bear – he’s ceramic and helps keep the brown sugar from turning to a brick. Just soak him for awhile in water, then toss him in your brown sugar container! 1. First, make your dough: Mix together all of your ingredients except the warm water. Be sure to separate when you add the salt and the yeast, because salt will kill your yeast and you won’t get a nice rise. Add about half of your water and let all the ingredients combine. Gradually add in the rest of your water until it all comes together into a dough. 2. Turn your dough out onto a lightly floured surface and knead it for about 10-15 minutes until it gets really smooth and stretchy. Lightly oil a large bowl with a bit of olive oil, then place your dough in, cover with plastic wrap or a clean towel, then leave in a warm place to rise for about an hour or so. The dough should nearly double in size when it’s ready. 3. Now, the funs starts! Prep a baking pan by lining with baking paper and set aside. Re-flour your work surface and turn out your dough. 4. 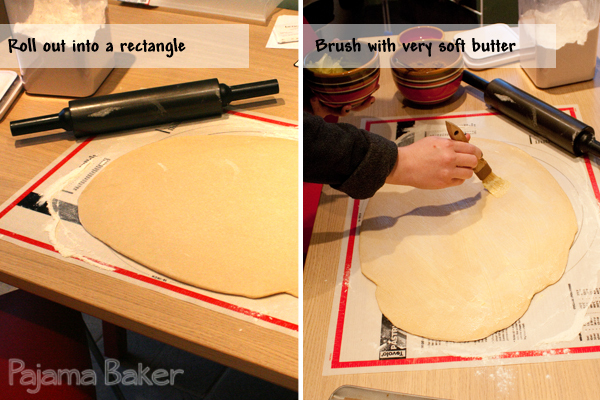 Grab your rolling pin and roll your dough out into a rough rectangle that’s about 1/4-inch thick. It doesn’t need to be perfectly square for the loaf to work, so don’t stress about it. 5. 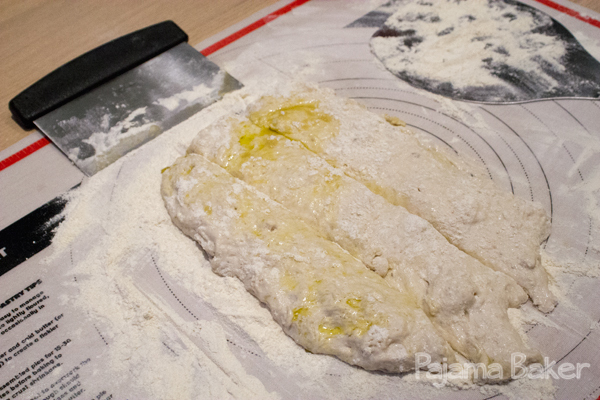 Then, using a pastry brush, cover the surface of the dough with a good hearty coating of your very soft butter. 6. 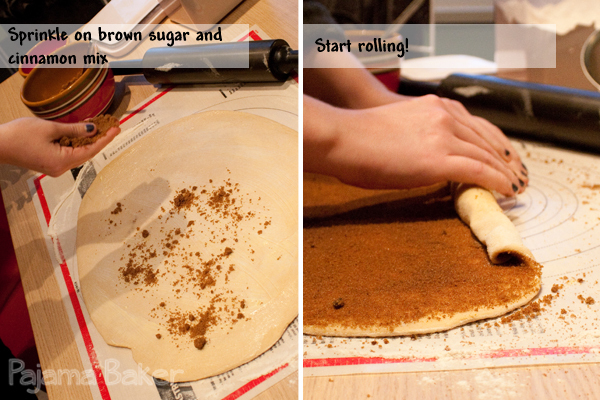 Cover the surface of your dough with your brown sugar and cinnamon mixture so that it all has an even coating. 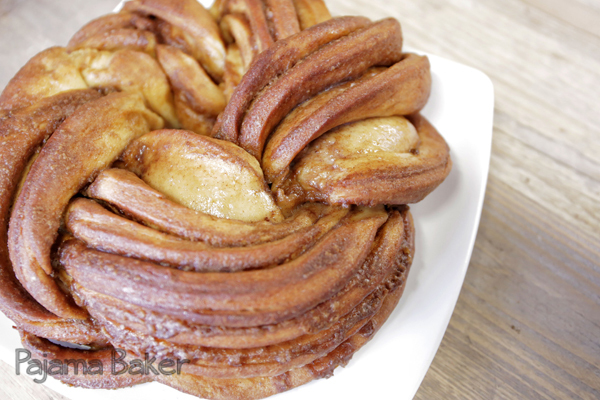 Be generous though, as the sugar will melt and create all of the delicious gooey-ness on the inside of your loaf! 7. 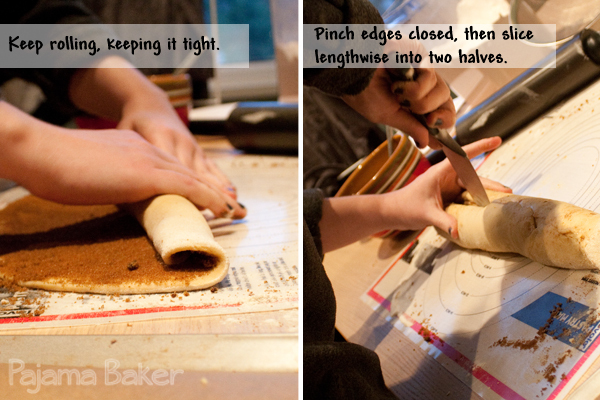 Next, roll up your loaf, making sure you roll with the longer edge, not the short one. 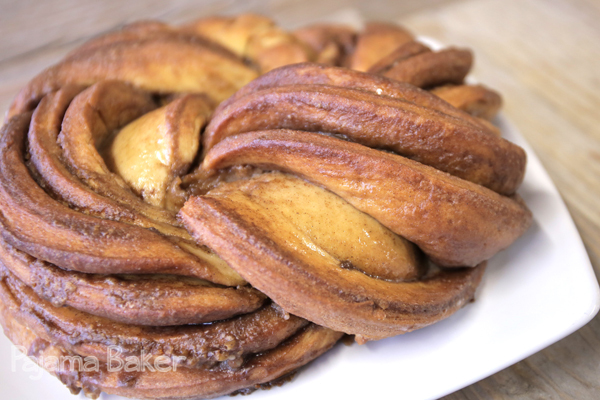 You want to roll it relatively tightly so that you get a good spiral, but not so tight that the dough won’t have room to rise or bake properly. 8. Once it’s all rolled together, pinch the seam closed, making sure it’s as sealed as possible. Then, slice your log-like loaf down the entire length so that you get two halves. 9. 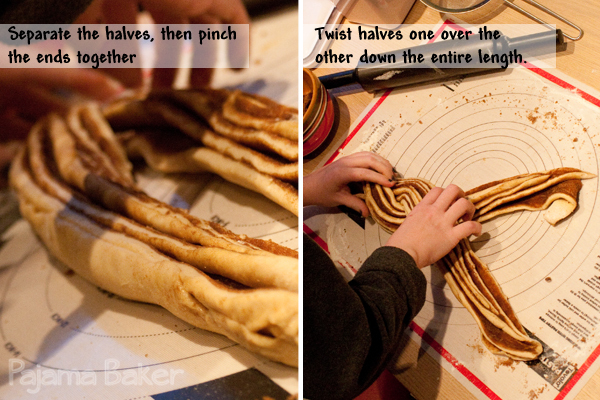 Pinch together the two ends of each of your halves, then start to twist them together, looping one over the other until you go down the entire length of your dough. 10. Once you’ve reached the other end, pinch those together as tightly as possible. 11. 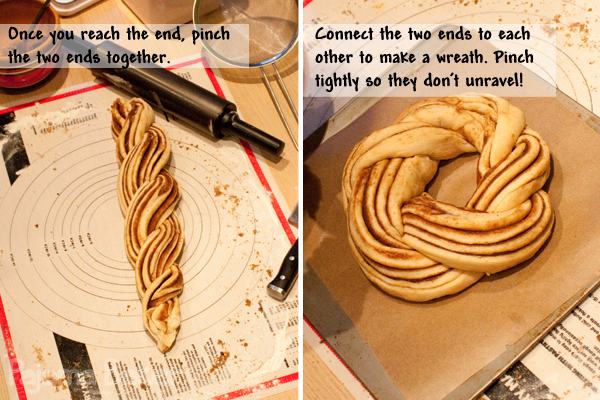 Carefully lift the two ends of your twist and bring them together to create a wreath shape. 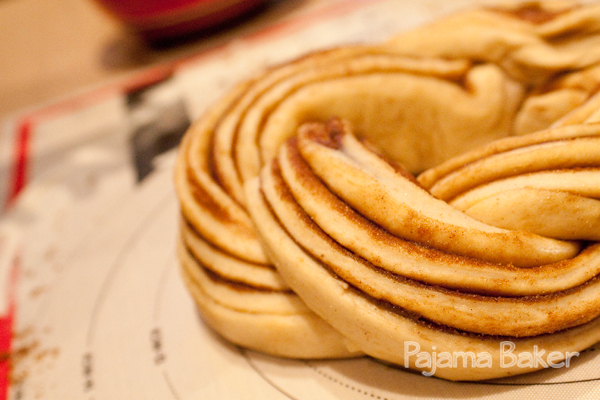 Now, make sure you seal off the two ends as best you can, so that the loaf doesn’t unravel in the oven! 12. 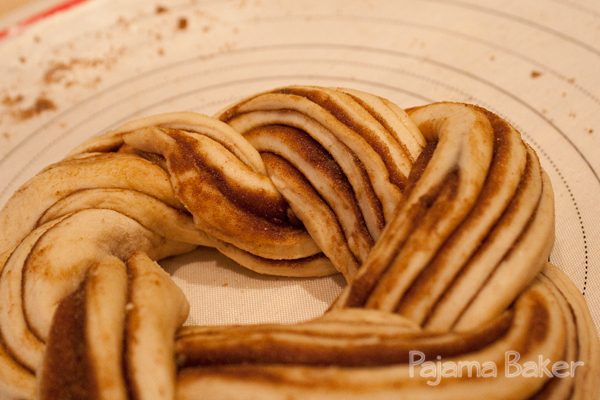 Mix together whatever’s left of your brown sugar and cinnamon mixture with your very soft butter. 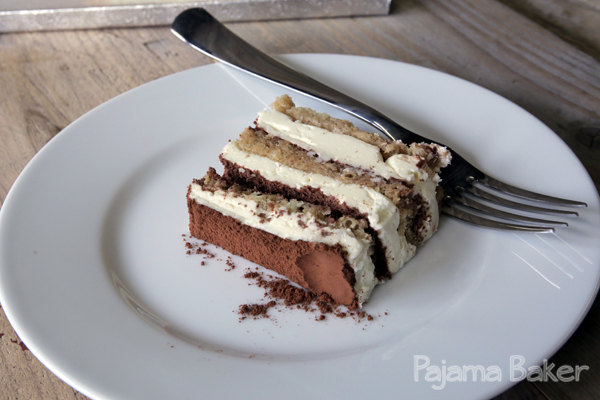 Pop it in the microwave for a few seconds so that it gets even softer, but not melted! 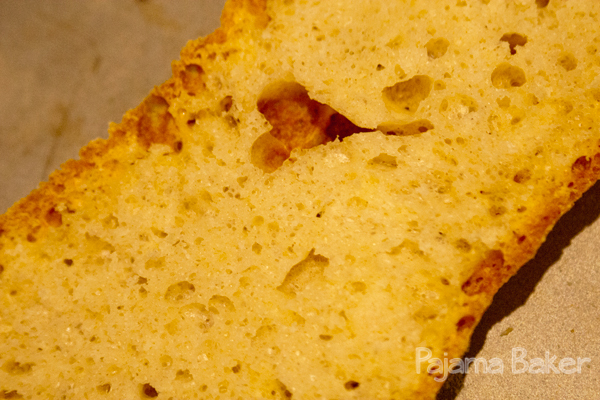 Brush this mixture over the top of your loaf to add more delicious golden brown gooey-ness. 13. Preheat the oven to 325ºF (170ºC), then set your loaf in a warm place to rise for about 30 minutes while your oven preheats. 14. Bake your loaf for about 20-25 minutes, until it turns a really rich golden brown. 15. While your loaf is still warm, mix together the icing sugar and vanilla with a bit of milk, gradually adding the milk until you reach a very runny consistency. Brush this over your warm loaf, then allow it to cool (or not, just get stuck in! ).